The PlayStation 2 is the successor to Sony's PSone and was originally released on March 4, 2000 in Japan. It is capable of running PSone and PS2 games, as well as playing DVDs and CDs. The PlayStation 2 had two versions, the PlayStation 2, and the PlayStation 2 Slimline. The only real difference – aside from the smaller size – is that the PlayStation 2 Slimline comes with the network adaptor built in, but does not have an expansion bay to add an internal hard disk drive. Also, the PS2 Slimline features slightly faster loading times, a slimmer profile, and a top-loading DVD tray (instead of the sliding tray that the original PS2 used). 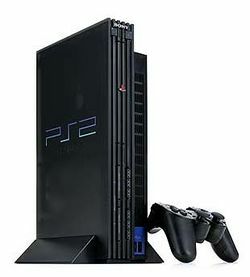 Some differences between the Playstation and the Playstation 2 was the color-change of the console from gray to black and a more advanced control setting. The Playstation 2 could also play DVD's. The PS2 logo as an icon. The PlayStation is also colloquially known as the PSX. The PSX (ピーエスエックス, Pī Esu Ekkusu?) is a Sony digital video recorder with a fully integrated PlayStation 2 video game console. It was released in Japan on December 13, 2003. Since it was designed to be a general-purpose consumer video device, it was marketed by the main Sony Corporation instead of Sony Computer Entertainment and does not carry the usual PlayStation branding. It was never released outside Japan. Pages in category "PlayStation 2"
This page was last edited on 7 January 2019, at 16:10. This page has been accessed 283,853 times.